Will the new Mexican president take the energy reform to the next level? With the upcoming inauguration of the Mexican president, a new parliamenterial confrontation is waiting. Attempted implementations of sustainable energy reforms, have never been implementated under the previous government due to corruption cases. Maximiliano Proaño asks about the feasibility under the new president. Andrés Manuel López Obrador (short: AMLO) will assume the Mexican presidency on December 1st, and his energy policy will play an important role in determining whether his term will be a success or failure, writes. The last government of President Enrique Peña Nieto reached an agreement for an energy reform, and a series of laws was passed that called for energy auctions both in the oil sector and in renewable energies. However, the corruption scandals around his government prevented these reforms from being implemented. AMLO’s new government will now be in charge of taking energy reforms to the next level. For this, he will have to make important decisions such as his promised review of oil contracts, a fracking ban, incentive policy for renewable energies, the future of public oil company PEMEX, among others. PEMEX is one of the fifteen largest oil companies of the world and the country’s biggest taxpayer. Successive governments in Mexico have tried to reform the energy sector. However, always the critical point it was the constitutional change to allow private participation in oil, gas, and power sector. The reform was finally approved in December 2013, after a broad political agreement reached a year earlier with the signing of the “Pact for Mexico”. This agreement – which included among many other issues an energy reform- was possible due to the consensus that PEMEX had to be modernized to be more competitive. Nine laws were approved and another 12 were amended, which opened the participation of private companies to the hydrocarbons, gas and electric power sectors. Until this moment Peña Nieto´s credibility had not yet begun to plummet due to corruption scandals, which brought him the lowest presidential approval rating in Mexican history. In this way Peña Nieto no longer had a coalition with sufficient political support to adopt the next stage in Mexico’s energy reform. The reform during Peña Nieto’s government consisted of a sectoral liberalization and privatization process, and did not fulfill one of its main promises to Mexico’s citizens: a decrease in energy prices. All this resulted in reform rejection of more than 70% of the population. In this context, the energy reform was an important issue in the last Mexican presidential elections. AMLO campaigned on the promise to stop the privatization process of the energy sector and the liberalization of gasoline prices. Another announcement during AMLO´s campaign was the review of oil contracts, where he promised to investigate possible corruption and the contradiction of national interests. Rocío Nahle García, the new Energy Secretary announced in August that 105 oil contracts, signed under Peña Nieto´s government, had already been reviewed and that work should be completed before the assumption of AMLO to the presidency on December 1. While AMLO has said that he will honor oil contracts, that does not mean that contracts stained by corruption will be fulfilled. In July of this year, AMLO made a very important announcement that his government would not allow fracking. The announcement is important because Burgos Basin, in the northeast of Mexico, has the largest concentration of unconventional gas in the country and is one of the largest in the world. During the last years, there has been a real possibility that the exploitation large-scale fracking would begin. In fact, the drilling of experimental wells had begun but were suspended due to the fall in oil prices. However, last March, Energy Lewis – the largest producer of natural gas in Texas just north of the border – signed a contract for exploration and exploitation with fracking in Campo Olmos, located in the municipality of Hidalgo in central Mexico. This contract is one of the 105 that are currently being reviewed by the future Mexican government. While the Mexican energy debate is almost entirely about fossil fuels, Mexico has enormous potential for the development of renewable energies. The Energy Transition Law (LTE) set a goal of 25 percent renewables in electricity generation by 2018, which it is already reached. The energy mix should be 30 percent renewable by 2021 and 35 percent by 2024. Wind energy has already begun to play an important role. In 2017, Mexico reached an installed capacity of just over 4,000 MW, equivalent to 5.55% of total installed capacity. As we can see in the chart below, solar energy has reached only 0.89 of the Mexican installed electric capacity by 2017. 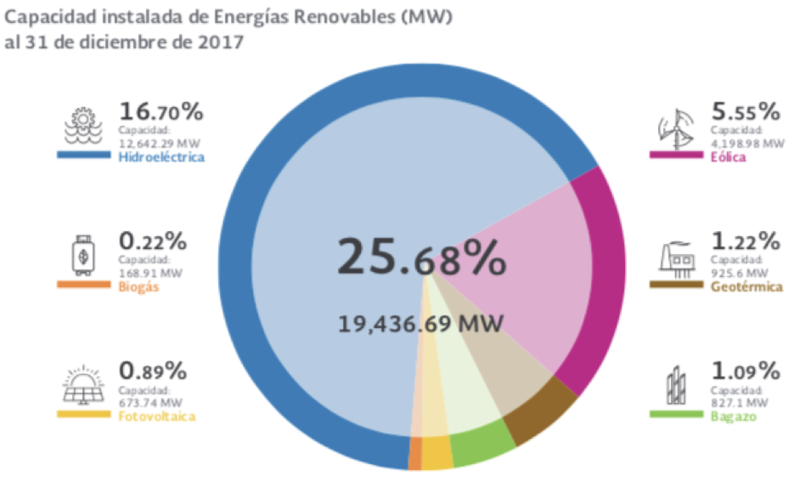 Source: Reporte de avance de energías limpias 2017, Secretaría de Energía México. The chart above shows that if we discount hydroelectric energy, renewable energies make up almost 9% of Mexican electric installed capacity today. However, the prospects are much more ambitious: the first three long-term auctions committed to an installed capacity of 6,988 MW of wind and solar energy to 2020. The Mexican Wind Energy Association (AMDEE) affirms that by 2022, installed capacity could triple and reach 12,000 MW. AMLO has not yet shown a clear policy push for renewable energies in Mexico. To achieve this, it will be key to generate adequate incentives for community and self-generation projects. So far, it is a good sign that AMLO has promised to close the door to corruption and fracking and to stop the privatization process of the energy sector while respecting legally concluded contracts made during the previous administration. If he manages to advance decisively in these matters, his government will be able to take the energy reform to the next step. Privatisation of the national oil company is not selling off the crown jewels but offloading a stranded asset while there is still time and a pool of gullible private investors. The same goes for Petrobras. Previous PostWhen coal dies, what of the coal workers?